OS X iframe malware injected into google.com. Yes, it's true, Mac's don't get viruses. But viruses are a small part of a larger security issue known as malware which is malicious software. And Macs are susceptible to malware. Malware is software that seeks to harm your computer. Computer viruses, just like real life viruses, attach themselves to something else to reproduce. Computer virus replication doesn't require any action by the user. But, other forms of malware, such as trojan horse software, does require action. Generally, a trojan will masquerade as something beneficial, such as a software or plug-in upgrade. A lady at this morning's Tech Coffee showed me a problem with Safari on her Mac. Last night, she thought she was installing a Flash update, but it turned out to be something else. 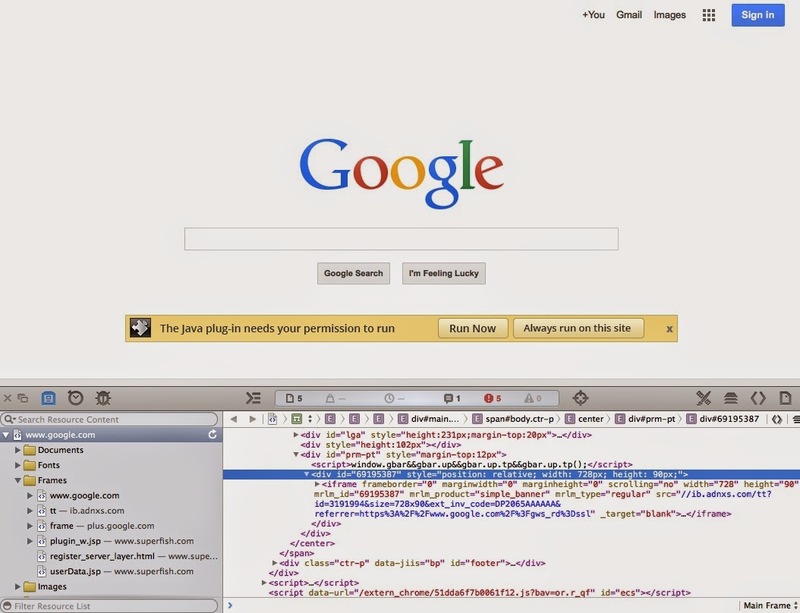 It was malware that injected an iframe in her home page, google.com. We tried different things to block, avoid, or fix the issue without any success. Her malware in the iframe would pop-up another window, when clicked on, asking to install more malware. It was an endless circle. We discussed different ways to fix the problem. Googling for anti-virus software brings up more bad actors than good ones. That's when we realized the best way to find Mac software was to look for it in the App Store. After some more discussion, we realized that she doesn't really need anti-virus software. She only needs something to clean up her mistake. Besides, it's been my experience on the Mac, that anti-virus software tends to get in the way more than it helps. Her next step is an appointment, tomorrow, at the Genius Bar. In the mean time, she won't be logging into her bank account.